The story of what happened in and around the 2013 bombing at the Boston Marathon has already come to the big-screen. Last year’s Patriots Day, named after the Boston holiday it took place, on, turned the events into a police procedural. This week’s new movie Stronger takes a different and more personal approach. Jake Gyllenhaal plays Jeff Bauman in this true-life tale. Jeff is a somewhat inattentive boyfriend to Erin (Tatiana Maslany), who’s running in the marathon. He makes the effort to go see her, though. Unfortunately he’s in the wrong place when one of the bombs goes off, losing his legs as a result of injuries suffered. The story follows Bauman’s journey through recovery as well as his reluctant acceptance of the role of inspirational role model for the whole city. 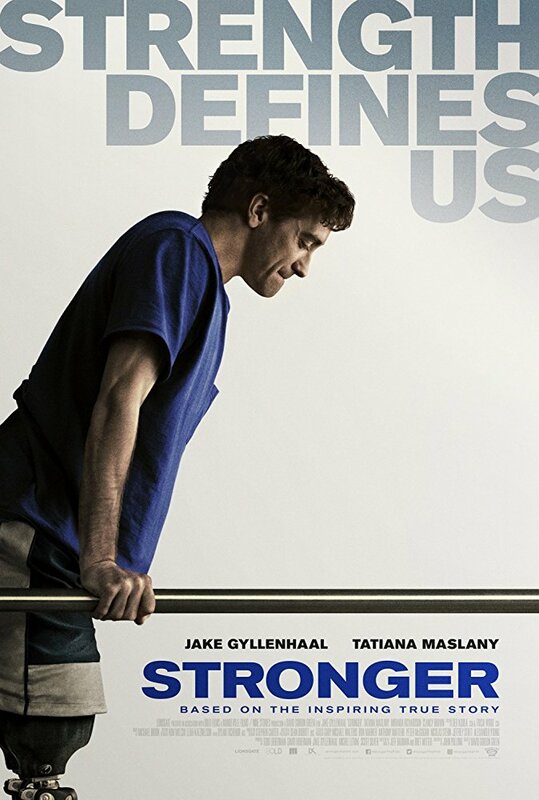 The poster shows Gyllenhaal as Bauman in the middle of physical therapy, straining on the bars as he learns to walk again using the artificial legs we can just barely see at the bottom of the photo. “Strength defines us” we’re told at the top while below the title we’re reminded this is based on the “inspiring” true story. The first trailer starts out as Jeff Bauman encourages everyone at a bar to donate and support Erin’s upcoming run in the Boston Marathon. From there we see that their relationship isn’t always rosy before an explosion goes off in the crowd watching the race. We see Jeff wake up to find he’s missing his legs and everyone is trying to support and help him. He’s struggling, though, for obvious reasons. Eventually he begins to accept the new reality, including how everyone wants to view him as some sort of inspirational figure. Well, it’s better than the trailers for last year’s Patriots Day, that’s for sure. It’s still all about hitting as many easy emotional chords as possible in an attempt to make the audience feel something, but at least it’s telling a personal, and therefore slightly more compelling, story. All the actors, from Gyllenhaal to Maslany, look fine as they’re asked to emote in various ways. There doesn’t appear to be an official website for the movie, just a Facebook page and Twitter profile where the studio has been sharing updates on the marketing and publicity. TV spots like this one show what happened to Bauman as well as the way the public expected something out of him that he struggled to deliver, namely the personification of hope and survival. We also see his rehabilitation and the work he does to eventually make peace with life and get better. Others like this were more concerned with focusing on the relationship between Bauman and Erin and how that changed over time. The trailer was used later on as an ad not only on social media but on YouTube, where it ran as pre-roll. There were banner and other ads run elsewhere online that used the image of Gyllenhaal in the midst of physical therapy to help sell the movie as an emotional and triumphant story. It was announced the movie would have its world premiere at the Toronto International Film Festival, where it received a good amount of praise for the performances by Gyllenhaal and Maslany. The real Jeff Bauman was interviewed here about not only the events he lived through but the experience of seeing a version of himself on screen. Gyllenhaal carried most of the publicity load, though. He was interviewed here about his production company which was created specifically as a place to shepherd smaller films that deserve a bigger audience like this one. While at Toronto he also commented that after years of being asked if he’d play a superhero, this role allowed him to feel as if he’d done so. He made appearances on various morning and late night talk shows as well to talk about the movie and the real-life story that inspired it. Usually my tolerance for these kinds of campaigns is pretty low. I don’t handle “inspirational” that well and tend to get tripped up in the attempts to blatantly appeal to my basest emotions. This one hit me in a different way, though. There’s plenty of sentimentality on display, of course. The sweeping music, the nicely-lit shots showing someone overcoming the odds and enduring despite all the setbacks. But it was presented as much more of an individual than a spiritual story, which is a very different thing. Maybe that’s the influence of director David Gordon Green or someone else who more interested in not underlining the universal truths but keeping the focus on a more relatable subject. Whatever the case, the campaign comes together very nicely as a cohesive whole. There are strong consistent elements throughout the push that create a single feeling in the audience and which could help the movie when it hits theaters this weekend. Previous Picking Up The Spare: IT, Home Again, mother!